The story of this movie begins in reality. Years ago, a man placed an ad in a real newspaper looking for “someone to go back in time with” him. He went on to write, “This is not a joke . . . Must bring your own weapons. Safety Not Guaranteed. I’ve only done this once before.” Screenwriter Derek Connelly obtained the rights to this infamous ad, and it is now the basis of the surprisingly touching and completely entertaining film, Safety Not Guaranteed. The fictional film follows three magazine employees as they hunt down the author of this ad after discovering it in a paper. The three employees, Jeff, Darius, and Arnau, played by the very funny Jake Johnson (New Girl,Ceremony), Aubrey Plaza (Funny People, Parks and Recreation), and newcomer Karan Soni hit the road for what is supposed to be a brief weekend assignment. Looking for a fluff piece to write about, they are not prepared for the twists and turns this journey takes them on. The trio locates the eccentric author Kenneth, played by the talented Mark Duplass (The Puffy Chair, The League, Humpday), and at first, they see him only as a joke. He is crazy; they are not. As the story progresses, however, Kenneth confuses them, offering more and more bizarre clues that force the trio to question their convictions. These waffling convictions not only include their ideas on time travel, but also their initial perception of the man behind the ad. The longer they stay, the more humanized Kenneth becomes. Kenneth, along with the rest of the cast, transform into empathic figures, all of whom end up doing some much-needed soul searching during this investigation. While Darius forms the most intense bond with Kenneth, Jeff goes off on his own, revealing that he has ulterior motives for coming to Kenneth’s town. Meanwhile, Arnau faces his own coming-of-age issues. Each character sinks deep into their own personal baggage, and director Colin Trevorrow deftly brings out a wide range of emotions from each character, giving a slightly absurdist film very real and complex emotion. The bottom line: This film has a lot of heart, and it tied with Beasts of the Southern Wild as my favorite movie from Sundance 2012. Don’t miss this one! 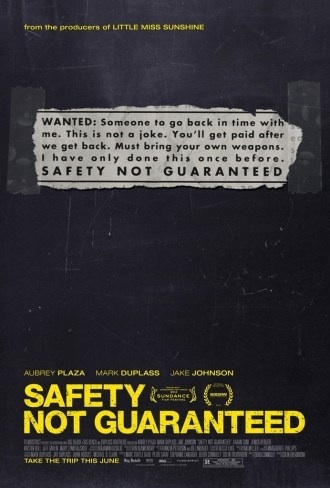 Safety Not Guaranteed has a DVD release date of October 30, 2012. All of my reviews are first published at Fanboycomics.net. Check out their site and if you like it, check out their podcasts or sign up for their newsletter (a daily highlight of the best in geek news).